*Please note that we are a 501(c)(3) and any monies donated are completely tax deductible. Please help us preserve the Beautiful Snake Creek Gorge and Banning Mills Township! Historic Banning Mills is a public 501(c)(3) conservation and retreat center. About 45 minutes NW from Hartsfield-Jackson airport, the facility is located in one of the most unique eco-environments in Georgia. If you would like to donate to the Conservancy at Historic Banning Mills, please click donation button. 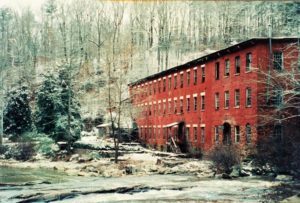 All donations made to Historic Banning Mills are tax deductible. 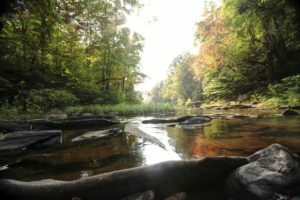 To preserve the unique and pristine ecosystems of the Snake Creek Gorge and Chattahoochee watershed areas as well as the extensive history of the Banning Mills township and gorge areas. 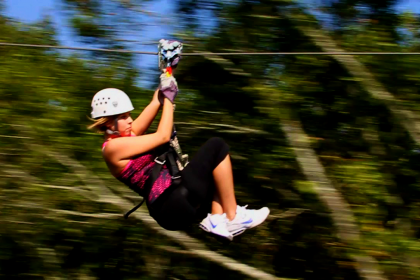 To promote leadership and character development with experiential adventure-based programs as well as increase community awareness of this special area through educational programs and publications. Our staff is passionate and dedicated to our mission goals. We have had many completed and successful program creations and implementations. We look forward to successful future goals as well. Implemented extensive historical research of the Banning Mills Township and Snake Creek Gorge with resulting production of History DVD and History book of the area. Acquired a master’s thesis that focused on the unique ecosystem of the Snake Creek Gorge. Provide educational bird of prey shows in our nature theater. Have acquired a permanent, on-site bald eagle which lives on site at the center in an FWS approved eagle enclosure. We look forward to expanding and developing more of our conservation projects for future generations to enjoy. To build a Creek Indian village: An Exact Replication. To increase educational opportunities with our Bird of Prey programs. To construct an eco tree walk bridge system for visitors to enjoy nature. Please note that we are a 501(c)(3) and any monies donated are completely tax deductible. Please help us preserve the Beautiful Snake Creek Gorge and Banning Mills Township! Dale started working with raptors in the late 60’s as a young boy grouping up on the family’s farm in Palmetto, Ga. He became interested while watching Mutual of Omaha’s “Wild Kingdom” on Sunday afternoons with Jim Fowler and Marlin Perkins. When he began to work with and learn about these beautiful creatures, he developed an interest in the ancient art and sport of falconry. Dale continued to work and hunt with his birds of prey while serving in law enforcement. After 27 years in law enforcement, Dale was forced to retire due to a cervical spine injury. However, his injury did not stop his work with raptors. Soon after retiring, a job opportunity to work at Callaway Gardens presented itself to Dale. Dale trained their birds of prey as well as opened their raptor programs. He was able to stay and lecture for four years. 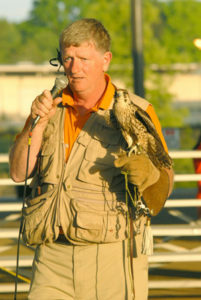 Over the years, Dale has trained and flown several species of falcons, hawks, owls, vultures, and eagles. His show ranges from pure falconry purposes to education, and even lecture opportunities throughout the southeast. During his leisure time, Dale spends time in the fields with his raptor companions, spending his day looking into the skies as the bonds with his birds of prey are renewed. Dale brings extensive knowledge into his programs and receives support from both Auburn University and his life-long hero and close friend, Jim Fowler. Come visit Dale and his Winged Ambassadors in our outside theater and experience our Birds of Prey Show. Liberty is the newest member of our staff here at Historic Banning Mills. She is a beautiful four-year-old Bald Eagle named Liberty. She came from Auburn University at the Southeastern Raptor Center located in Alabama. Since Liberty is an imprinted raptor with visual deficits and some hip difficulties, she can never be released back into the wild. If she were released, she would die. 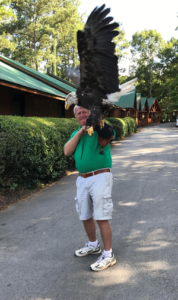 Historic Banning Mills is honored to be able to care for Liberty and showcase her in our educational bird of prey shows with Master Falconer, Dale Arrowwood. We hope our patrons will be able to come and see Liberty as well as learn amazing facts on our national emblem.